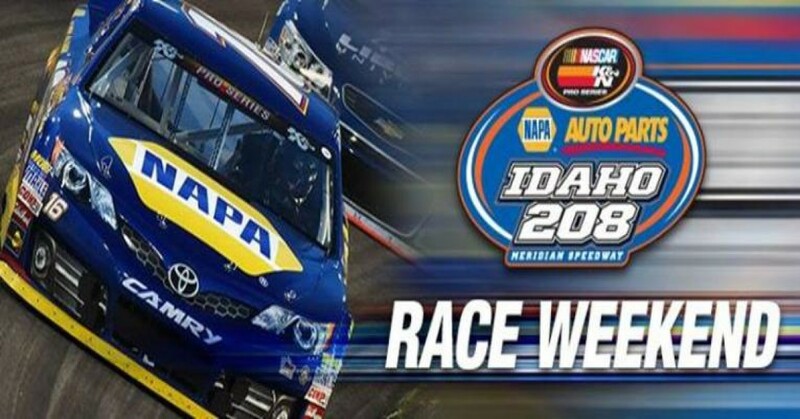 NASCAR K&N Pro Series West: NAPA Autoparts Idaho 208 ticket donation to Military families and also Raffle Tickets to win opportunity to race with Patriot Motorsports Group. The regional touring series of the NASCAR K&N Pro Series West returns to Idaho for the 4th time in 32 years! 20+ Drivers from around the country will be competing in a brutal 208 lap race at the 1/4 mile oval of Meridian Speedway. Race Giveaway Raffle :From now through May 31st 2017 we're holding a raffle at Patriot Motorsports Group. The drawing will be held no later than June 8th 2017 LIVE on Patriot Motorsports Group Facebook. Prizes go as follows: 3rd place wins a free full test day in any type of racecar we have (B-Mod, Late Model, K&N Stockcar) at Meridian Speedway in Idaho, 2nd place wins a free raceday in a B-Mod at Meridian Speedway in Idaho or 2 free full test days in any type of racecar we have (B-Mod, Late Model, K&N Stockcar) at Meridian Speedway, and 1st place wins a free raceday in a B-Mod and Late Model at Meridian Speedway or 3 free full test days in any type of racecar we have (B-Mod, Late Model, K&N Stockcar) at Meridian Speedway. In addition to the 1st place prize, if 1000 or more raffle tickets are sold between all participants, the 1st place winner will also receive a free race in a NASCAR K&N Pro Series car at Meridian Speedway in the Idaho 208 race Sep 30th 2017 on NBC Sports. Any person who purchases 20 or more tickets AUTOMATICALLY wins ONE free test day in a B-Mod or Late Model at Meridian Speedway. The more tickets you buy, the better your chances. Each ticket is $25 and also each ticket purchased will be donated to military families in the local Boise Area so they can come watch the NASCAR Idaho 208 race. For anyone who wins the raffle and chooses not to race, they can donate their races to someone else.